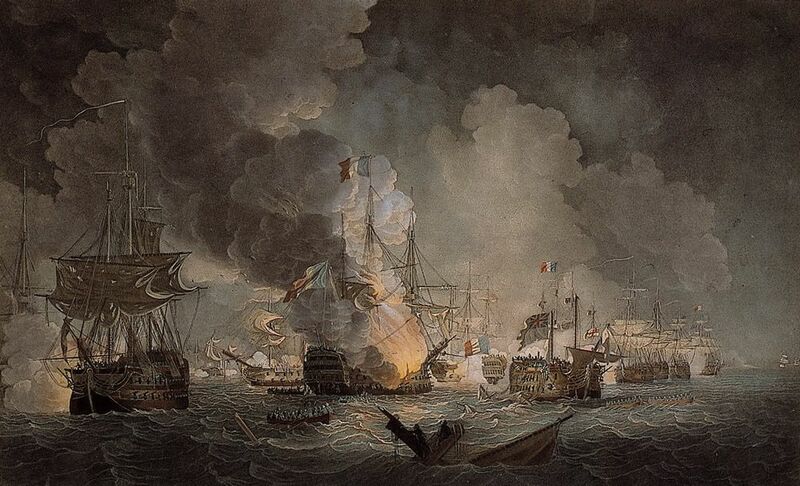 Mounted coloured aquatint of the Battle of the Nile representing the situation of the British and French fleets prior to the blowing up of the French Flagship L'Orient, 1st August 1798. She is in the middle of the picture. Flames are pouring from her deck although the fire has not yet brought down her masts. British ships pictured are HMS Majestic (1785), HMS Alexander (1796), HMS Orion (1787), HMS Bellerophon (1786), HMS Vanguard (1787), HMS Culloden (1783) and HMS Mutine (1797). This Battle of the Nile Art Print is created using state of the art, industry leading Digital printers. The result - a stunning reproduction at an affordable price.